Grapes can be grown in the backyard, but trellises will be needed to support them. American varieties are hardier and more suited for table use than European types. 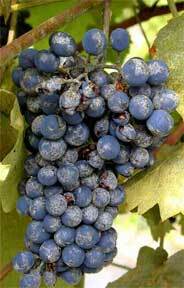 Suggested varieties include 'Niagara,' 'Steuben,' 'Swensen Red,' 'Fredonia,' 'Delaware,' 'Concord,' and 'Reliance' (seedless). Grapes require severe annual pruning early each spring to remain productive. Grapes flower and produce fruit only on one-year-old canes. The most productive wood is on the 6 to 8 buds closest to the base of the cane. Canes with moderate vigor and about the diameter of a pencil are most productive. So pruning is needed to encourage new canes to develop, eliminate unproductive canes, train fruiting canes, and limit the number of buds on the vine. When done properly, pruning often removes 80 to 90 percent of the wood. Pruning is suggested after the coldest part of winter but before buds swell. February and early March are good times. Suggested cultivars for dessert and juice for northern Illinois are: 'Niagara,' 'Steuben,' 'Swenson Red,' 'Fredonia,' 'Delaware,' 'Concord,' and 'Reliance' (seedless); central Illinois are: 'Steuben,' 'Swenson Red,' 'Niagara,' 'Ontario,' 'Buffalo,' 'Canadice' (seedless), 'Glenora' (seedless), and 'Marquis' (seedless); and southern Illinois are: 'Catawba,' 'Himrod' (seedless), 'Einset' (seedless), and 'Remailly' (seedless). Grapes require severe annual pruning early each spring to remain productive. Grapes flower and produce fruit only on one-year-old canes. The most productive wood is on the 6 to 8 buds closest to the base of the cane. Canes with moderate vigor and about the diameter of a pencil are most productive. So pruning is needed to encourage new canes to develop, eliminate unproductive canes, train fruiting canes, and limit the number of buds on the vine. When done properly, pruning often removes 80 to 90 percent of the wood. Pruning is suggested after the coldest part of winter but before buds swell. February and early March are good times. Various training systems can be followed when pruning, with the Four-Cane Kniffin one of the more popular. This system ends up with a central trunk and four one-year-old lateral canes, or arms, supported by trellis wires. Each arm has 6 to 12 buds, for a total of 35 or more buds on the entire plant. Each bud produces two or three clusters of grapes. Two renewal spurs are left at each trellis wire for future fruiting canes. All other growth essentially is removed each year to leave this framework.